Grenchen. 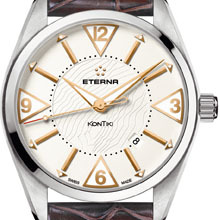 Eterna is adding a second date display watch to its KonTiki collection – the KonTiki Date. With its new creation, the watchmaker is enhancing this line of classic timepieces, whose emblematic triangular indices have come to characterise Eterna over the past half-century or more. The indices and hands are coated with a luminous mate-rial for optimum legibility at all times, even under poor lighting conditions. The KonTiki Date is the first model to feature a date aperture positioned between 4 and 5 o’clock. The new summer models are available from now on. “Kon-Tiki”, a term derived from the Inca tongue, was the name of the famous balsawood raft on which the Norwegian anthropologist and adventurer, Thor Heyerdahl, set off from South America in 1947, determined to sail across the Pacific to French Polynesia. This dar-ing venture using a self-built raft showed that French Polynesia could have been colo-nised by migrants from South America as well as from Asia. The voyage took more than two months, during which time Heyerdahl and his crew wore rugged Eterna watches that kept accurate time throughout. 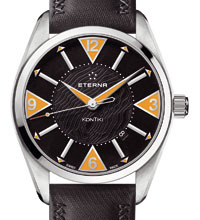 Eterna’s line of sports watches bears the name KonTiki in commemoration of this epic crossing. Eterna is now set to extend its traditional KonTiki family: the new KonTiki Date, which features a date aperture, joins the KonTiki Four-Hands (with date hand) and its XXL ver-sion (44 millimetre diameter case) as well as the KonTiki Chronograph. Common to all is the satin-finished, polished stainless steel case and water resistance to depths ranging from 120 to 200 metres. Extreme depths are catered for by the KonTiki Diver. The face of the KonTiki Date is, however, completely new. Both black and white dial op-tions, with their date window positioned between 4 and 5 o’clock, feature an outline of Raroia, the atoll in French Polynesia that marked the successful, if unforeseen, end point of Heyerdahl’s expedition. The flat dial and the omission of a dial ring make the watch appear larger and more youthful. The various versions of the KonTiki Date with their rhodanized, blue or gold-coloured tri-angular and bar indices feature identically coloured hour, minute and second hands. The luminous white, black or orange material with which they are coated ensures optimum legibility whatever the light conditions. A characteristic colour accent is provided by the red-tipped second hand. The hour, minute and second hands and the date display of the KonTiki Date are powered by the self-winding Sellita calibre SW 200 movement, which delivers a power reserve of 38 hours. The timepiece is available on a polished and satin-finished stainless steel bracelet with folding clasp, a brown alligator leather strap with pin buckle, or – for an even sportier look – a black leather strap with embossed textile surface, also with a pin buckle. The leather straps feature cross stitching specially developed for the KonTiki collection, a detail that recalls the ropes deployed to build the raft used in the expedition. Timeless and rugged, the KonTiki Date is sure to impress today’s generation of adventur-ers. In particular, though, it will appeal to a younger clientele looking for an attractive watch they can depend on – whatever the occasion. Eterna has been a byword in high-quality mechanical timepieces manufactured by tradi-tional watchmaking craftsmanship since 1856. Numerous major developments have emerged from the company’s long history. 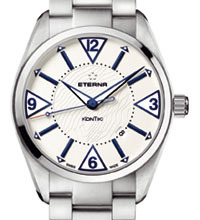 Revolutionary innovations such as a rotor mounted on ball bearings and a chronograph with mechanical digital stopwatch display originated from Eterna. Other milestones include the recently developed 3030 movement with a cambered big date as well as the calibre 3500 hand-wound movement. This tradi-tional Swiss brand now belongs to Ferdinand Alexander Porsche, and is one of the world’s last existing independent watchmaking companies. As a Porsche Design Partner, Eterna is responsible for the popular Porsche Design watch collection.